I took this at Ground Zero on September 13, 2001. For more photos, click here. After living through September 11, 2001, in New York City and watching downtown burn for 99 days, I wound up at The New York Times reporting on the fall of the World Trade Center for three years. I didn’t realize at the time that losing two friends and breathing that ash for months was driving me toward this work. Processing trauma took an unexpected form. It was three years of extensive interviews and archival research for Times’ books 102 Minutes: The Fight to Survive Inside the Twin Towers, by Jim Dwyer and Kevin Flynn and City in the Sky: The Rise and Fall of the World Trade Center, by James Glanz and Eric Lipton. The work involved talking to dozens of firefighters, ironworkers, survivors, and victims’ families, reconstructing minute-by-minute what happened in particular people’s lives that day. Memories weren’t always what had actually occurred, I found. One father wanted to remember that the last words his son had said to him from inside the towers had been a meditative prayer. But it wasn’t, other family members told me. They, too, had been on the line that morning. Along the way, I also discovered the only ironworker to have both constructed and cleaned up the towers. He was matter-of-fact and painted himself as part of a collective—the union guys I talked to were nothing if not unpretentious. 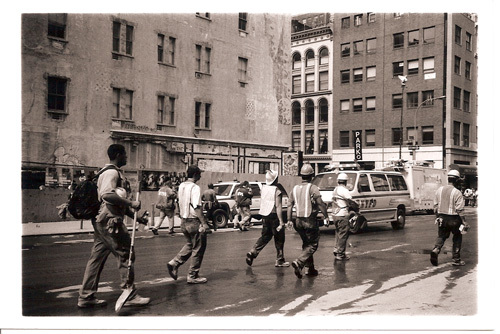 Before these projects, I contributed to a book called At Ground Zero: 25 Stories from Young Reporters Who Were There. Reading it now, I see that trauma hadn’t found its way out of my being yet; it took connecting with all those survivors, first responders, and families who were processing their pain too. Together, I guess that’s how you keep going. It seems to be how I have.